The Abicana webstore - jewelry and watches - especially adorns with pearls, also information about pearls and about the physical and chemical properties that give color to gemstones. Welcome to this online presentation of good online jewelry shops and an exhibition of some of their products. At this page you will especially see jewelry pieces with white, black and colored pearls, but also some pieces with colored gemstones. Pleace click on the banners to see more or buy. Further down there is some information about pearls and how gemstones get their appearance and colors. An extraordinary display of technique and craftsmanship Tagliamonte's 18K yellow gold ring showcases stunning hand carved mother of pearl portraying the Three Graces in a natural pearl white hue. Gift box included Made in Italy. A general store with a lot of jewelry and apparel, much body jewelry and a great inventory of watches for very law prices. Add this unique and beautiful accent to expand your jewelry collection. This gorgeous piece of jewelry is a perfect gift. An extraordinary display of technique and craftsmanship Tagliamonte's 18K yellow gold ring showcases stunning hand carved mother of pearl portraying the Three Graces in a glowing fresh green hue. Gift box included Made in Italy. Pewter. 24K Gold Plating. Semi Precious Stones. Czech Glass Pearls. Swarovski Crystals. Lobster Claw Closure. Made in the USA. Measurements: 16L, 5W. 2" extender. Meet the Byzantine Empire. A time, eons ago, when decadent fashion was a symbol of royalty and women were adorned with jeweled crowns and pearls; where silk reigned supreme, and gold thread was intricately woven into embroidered garments. This season, that is exactly where designer Isaac Manevitz takes us with the all-new Ben-Amun Byzantine Pearl collection. Pearl drop brooches, statement tassel necklaces, and teardrop pearl layered necklaces are offered, complete with deep red, blue, and purple gems. 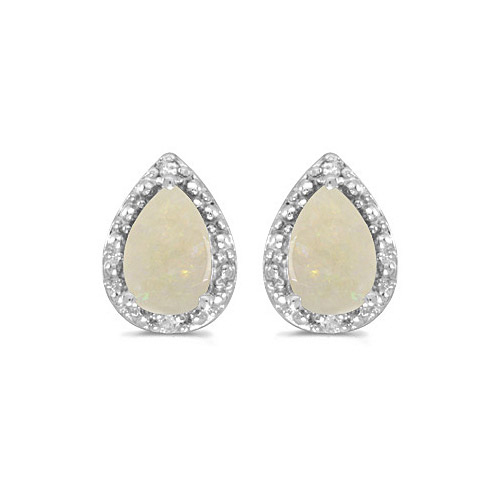 These 10k white gold pear opal and diamond earrings feature 6x4 mm genuine natural opals with a 0.42 ct total weight. This unique pave of sparkling diamonds twists around a lovely pearl center creating a contemporary look with perennial elegance. CTW 0.70 color G clarity VS. Signature box included. Made in Italy. 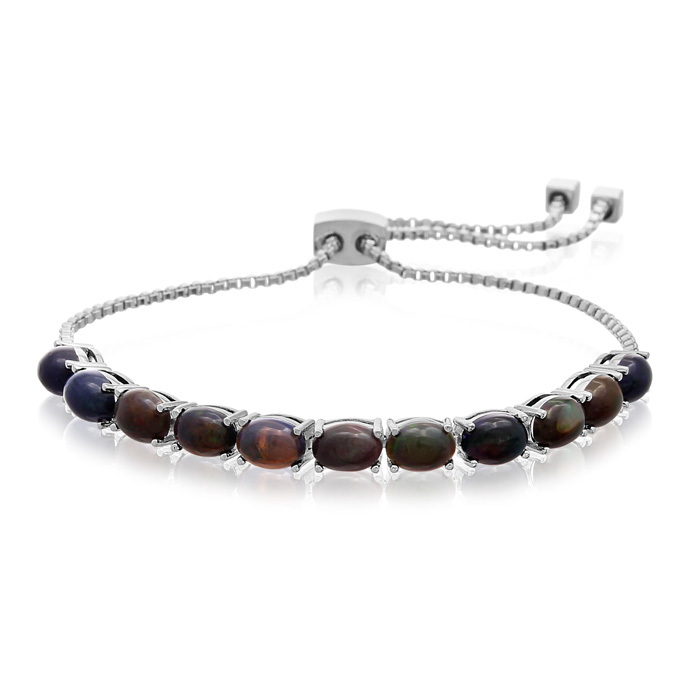 This gemstone tennis bracelet is taken to new levels with an adjustable slide closure. This bracelet features 11 oval shape 7x5mm black opal gemstones totaling at 5.50 carats. This bracelet has a box chain with an adjust slide clasp to adjust to fit any wrist size. This bracelet is crafted in platinum overlay. 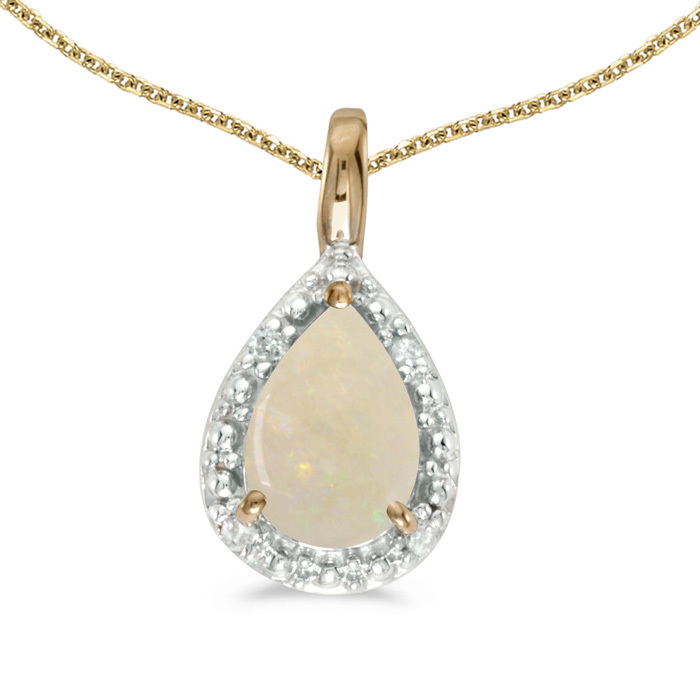 This 14k yellow gold pear opal pendant features a 7x5 mm genuine natural opal with a 0.21 ct total weight and bright diamond accents. 18" 14 Karat Gold Chain Included. The beauty of this breathtaking drop pendant is luxurious featuring 7 diamonds with a total of .11 carats that cascade into a lovely pearl in an 18K gold setting. Hung from an 18K gold box chain it is uniquely elegant in its charm. Diamond total weight 0.14ct; color G/F; clarity VS/SI. Signature box included. Made in Italy. Working in cameo and coral art for over five generations the Del Gatto family has hand-carved an elegant young woman with pearls and flowers on this cornelian heart cameo made from a particular Southeast African seashell. It can be worn as a pendant or pin. Gift box included. Made in Naples Italy. Two Hands Silver Ring w/Pearls is elegantly crafted in (690 gr) polished bronze with two pearls (110 gr)in an asymmetrical open design that features two banded hands lightly holding pearls. The jewelry pieces undergo a ceramization process to preserve their brilliance and prevent oxidation. Hand made in Italy. One size adjustable. RC Luxe Earrings w/Pearls crafted in light gold toned brass are elegantly bold and feature gray crystal encrusted Cavalli signet and crystal post backing with pearl bead accent. Made in Italy. Nothing creates a classic style like diamonds and pearls. This lovely piece features 3 diamonds with a total weight of .09 carats finished by a remarkable white pearl and hung from an 18K gold box chain. Diamond total weight 0.09ct; color G/F; clarity VS/SI. Signature box included. Made in Italy. Buckle Collection Silver Tone Stainless Steel Case and Orange Leather Strap Women's Watch is an elegantly crafted timepiece with distinctive buckle shaped dial sure to add a touch of classic elegance to your style. Featuring 37mm stainless steel buckle shaped case silver dial with guilloché finishing stick and diamond (0.01 ct) indices anti-reflection scratch-resistant sapphire crystal crystal quartz movement and vegetable tanned calf leather band with top stitch detail and deployant buckle w/safety clasp. Water resistant to 3 ATM. Swiss made. Customized Rolex Milgauss Emerald Baguette Men's Watch part of the MAD Diamond Series is an anti-magnetic worn by scientists and engineers and coveted by those who want nothing more than perfection. Featuring 40 mm case matte black dial with green details and iconic lighting bold seconds hand baguette emerald set bezelhand-painted hour markers and hands black DLC and matte finish. Original Rolex perpetual mechanical self-winding movement with a protective magnetic shield. Please note: This item is made to order. 30% advance deposit required. Customized Rolex Submariner Obsidian Men's Watch part of the MAD Xclusive Series is a classic diver's watch that has a timeless elegance which can pair with everything from elegant business casual to a tuxedo. Featuring 40 mm case black dial black luminessences red detail removed crown guards matte black bezel sapphire crystal back case black DLC and matte finish. Original Rolex perpetual mechanical self-winding movement. Please note: This item is made to order. 30% advance deposit required. T01 Lady Rose Gold Stainless Steel and Black Leather Women's Watch is a classic watch with heritage style. Featuring round rose gold PVD stainless steel case anti-reflective sapphire crystal rose gold face with diamond indices and classic pattern originally used to line Trussardi trunks over a century ago. Black crocodile skin strap with pin buckle. Swiss made movement. Minuetto Silver Tone Stainless Steel Case and Purple Leather Strap Women's Watch is a beautiful timepiece that is sure to have you arriving in style. Featuring 36mm stainless steel round case textured silver dial and plate detail stick and dot indices with diamond at the 12 saffiano leather band w/ stitching detail and deployant buckle and crystal quartz movement. Water resistant to 3 ATM. Anti-reflection scratch-resistant sapphire crystal. Swiss made. Minuetto Gold IP Stainless Steel Case and White Leather Strap Women's Watch is a beautiful timepiece that is sure to have you arriving in style. Perfect to complete your classically elegant look. Featuring 36mm gold plated IP stainless steel round case mother of pearl dial with textured gold plate detail stick and dot indices with diamond at the 12 white leather band w/ stitching detail and deployant buckle and crystal quartz movement. Water resistant to 3 ATM. Anti-reflection scratch-resistant sapphire crystal. Swiss made. A pearl is a gemstone produced by mussels when some irritant get into the flesh near to the shells. The irritants most potent to stimulate the mussel to produce a pearl are organic particles and parasites, not sandgrains as usually thought. The mussel produce the pearl around the ittitant to catch it and shield it from itself. This reaction from the moussels is probably a protective reaction against parasites. Many species of saltwater and freshwater mussels can produce perls, and so can also some snails. The freshwater pearl mussel (Margaritifera margaritifera) is just one example. The substance at the inside of a mussel shell is the same as that substance perls are made of, called mother of perls or nacre. This substance consists of very thin concentric layers of of miroscopic calcium carbonate chrystals in the form of the minerals aragonite and chalcite glued together with a horn-like substance called concholine, which is a blending of organic substances like chitine, lustrine and silk-like proteins. Because the crystals in each layer are not aligned directly over each other, the light is diffracted when going from one layer to another and some of the light is mirrored back at the top of each layer. This way the pearl gets a diffuse shiny luster and a diffuse play of colors called irrdiscence. The thinner the layers are, the finer will the structure of the irridiscence get. Pearls with especially fine layers that are nearly perfectly round are regarded as the most beautiful and are generally higher prized. Most perls have a greyish basic color, but some pearls are very dark, called black pearls. Natural pearls of good quality are very rare. Therefore pearls are produced by cultivation of mussels and by introducing some irritant into the flesh of the mussels, for example peanut butter. Commercially available pearls can be of several origines: Saltwater natural pearls, saltwater cultured pearls and freshwater cultured pearls. Some pearls originate from big saltwater snails. Nacre (mother of pearls) is the inner layer of the shells of muosles and of the houses of snails. It is composed of layars of the calcious minerals aragonite and chalcite with layers of choncholine between. Nacre shows an irridiscence of the same type as pearls and pieces or plates of nacre are used as decorative elements on many objects or as gemstones. Most gemstones consist of one or more crystals with atoms or molecules (consisting of several atoms) bound together in a regular framwork fashion, called a crystal lattice. Most gemstones, at least in their final shape, consist of just one crystal, fro example diamonds, rock crystals, rubys amd emeralds. Some genmstones consit of myriads of microscopic crystals, this kind of structure is called microcrystalline, for example agath and onyx. Also perls and mother-of-perls are microcystalline. The same is true about noble materials like ivory and other beautiful animal teeth. Some gemstones ar not crystallic at all, but some kind of glass, for example obsidian (volcanic glass) and opal. And one type of gemstone, namely ember, is actually a sort of natural hard plastic. It is formed from resin from trees that have been chemically and physically harded through thousands or millions of years. The physical composition is very determining for how the gemstone will look. Monocrustalline gemstones are often limpid and transparent. They are also able to refract the light and thereby give an raibowish appearance. The greater the ability of refraction is, the more vivid is the raibowish play of light. Microcrystalline gemstones can be translucent, but never transparent. The refraction in all those crystals can give specific fascinating effects, but not like a plain rainbow. If for example the crystals are orderd into thin layers over or adjasant to each other, the effect can be like the beautiful shiny effect in mother-of-perl where the colors gradually shift from place to place and shift gradually also when you change the angle of sight. If the layers are thicker and have different colors, the gemstone can show beautiful bands of different colors. Gemstones with compsition like glasses or plastics are often transaparant or nearly transparant. But also these can have a layered structure that shows an apparance like mother-of-perl. White light consists of light with a lot of wavelengths, perceived as different colours when they hit the eyes. When white light falls into the atoms in the crystal lattice, some of the wavelengths are absorbed by the individual atoms or by the structure of the lattice. The energy in the waves absorbed is converted to heat. Some of the light that is not absorbed is reflected from the surface, and some will be let through the gemstone. Since the light reflected and the light comming through will have selected wavelengths, this light will look coloured. However, tho light falling on a gemstone is not allways perfectly white. If one of the wavelengths normally let through or reflected lacks from the light falling in, the gemstone will look different than in white light. If the light falling in totally lacks the wavelengths normally let through, the gemstone will look black in that light. The crystal lattice can have foreign atoms or small foreign molecules dissolved or trapped between the atoms making up the framework of the crystal, for example iron, copper, cromium or water. Also these dissolved elements can absorb light of certain wavelengths and contribute to the colour of the gemstone. Different pieces of the same basic type of stone can have different dissolved substances. Many types of gemstones therefore are found in different colours, and even one and the same stone can have different dissolved substances from place to place, giving the stone colour shadings. Sometimes different coloured gemstones of the same type has different names. An example of this is corrundum that can be found in the gemstone variants rubuine and saphire. Some types of atoms in a stone often give some typical colours. Iron will often give a red or brown colour, copper will often give the stone a green colour, cobalt gives blue. It is often possible to change the colour of a stone by dissolving foreign elements in the stone. Agats are often artificially coloured in this way. Light falling into a gemstone will be refracted, but the different wavelengths will be refracted in different degrees. Thus the different wavelengths comming through will be spatially separated and the stone will show several simultaneous colours. Therefore the refraction process will also contribute to the colour of the stone. However, colours from the refration process will vary according to the angles from which one regards the stone, and the angles from which the light falls into the stone. Gemstones can be composed of many crystals composed together, or be cut in a complicated way with many facets. A crystal can also have a lot of tiny cracks in the lattice. In these cases the stone will show a very complicated colour play resulting from simultaneous refraction in all parts of the stone. Diamonds are usually cut in such a way to maximize this process. Certain atoms or crystal structures absorbe light, but sends the energy immediately out again in the form of light with a different wavelength. This is called fluorscence. Flourescence is also a way by which a stone gets its colour. In some rare instances, the energy absorbed is stored in the stone for some time, and sent out again slowly in the form of light with a characteristic colour. A gemstone having this property will seem to glow in the dark. This phenomenon is called phosphorescence. Ultraviolet light from the sun can sometimes cause phosphorescence in some minerals. Sometimes the crystal of a stone contains inclusions of foreign elements that are greater than dissolved individual atoms or molecules. The size of such inclusions can vary from microscopic objects to small grains visible by the eye. They can be small crystals of other minerals, small drops of water or small drops of oily substances. Such inclusions can absorb wavelengths of their own, they will refract light and can show fluroescence. Such inclusions will give a gemstone a complicated colour play. An example of this is the gemstone opal that contain small drops of water giving the stone a complicated colour play. If the inclusions are great enough, they can also give the gemstone a myriad of tiny spots of different color than the ground color of the stone. Colors can originate form the main components or the crystal lattice, but often the colors comes from impurities in the crystal lattice, replacing the regular ions. Mostly colors originate in metal ions form the transient groups in the periodic table. These have an incomplete set of 3d-electrons. The elecrons in these elements can absorbe visible light of certail wavelengths, and thus light passing through or being reflected will lack these wavelengths and thus become colored. In other instances color originate from impurities of atoms having another number of valences that the main atoms of the lattice. This makes it possible for binings to be broken and new bindings reappear with another valence electron. There may be an energy difference between two such althernative bindings and this shift can be made by absorbtion of energy from frequences of visible light. Such inclusions are called color centers. In still other gemstones there is exchange of electrons between two adjacent transition metal ions of differing oxidation states. The energy needed to transfer an electron from one ion to another corresponds to the energy of visible light. This is called intervalence transition. Clear / colorless - In this case little light is absobed, and the light absorbed are of all wavelengths. Crystals having cilicone or calcium as positive ions / elements in the lattice, generally are white. Examples are quarts crystals. White - Also in this case little light is absorbed, but there are millions of small elements whithin the stone or crystal that defract and reflect the light. Red - Red often originate in cromium present as impurities in the shape of cr3+-ions. Red may also come from iron (fe2+) present as impurities or as apart of th ecrystal lattice itself. Blue or bluish-green - Copper (Cu2+) often makes this color.